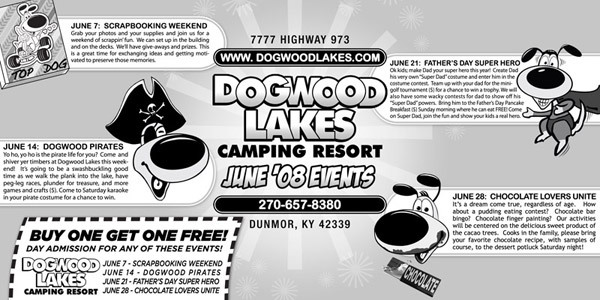 I created this newspaper ad design series while working for Dogwood Lakes Camping Resort in Dunmor, KY. 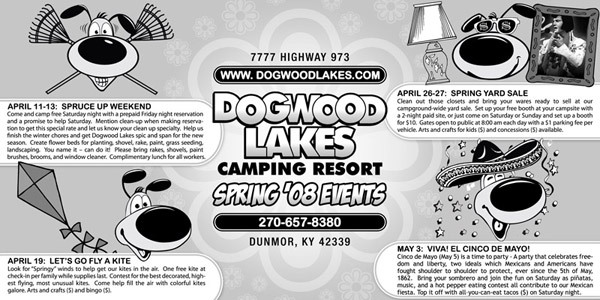 The long beloved Western Kentucky campground held annual motorcycle rallies and concerts during my time working as their in-house Graphic Designer. 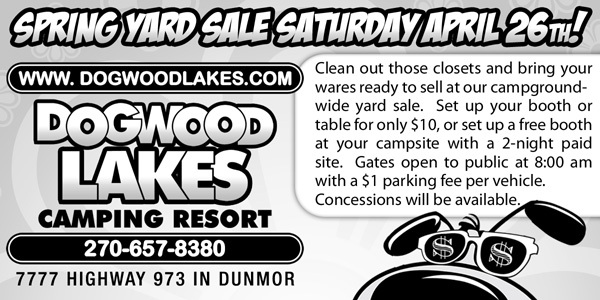 Dogwood Lakes also held smaller community events such as yard sales. Holiday parties and haunted houses also became popular. 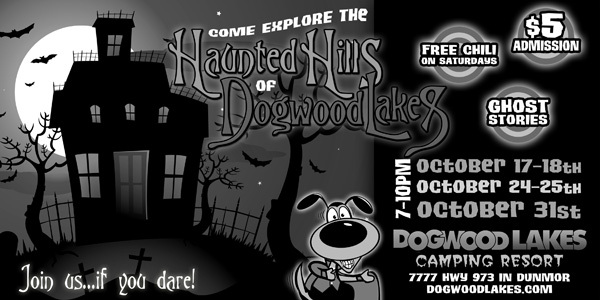 The campground had grown in recent years, so my employers let me design these ads to promote their upcoming events. 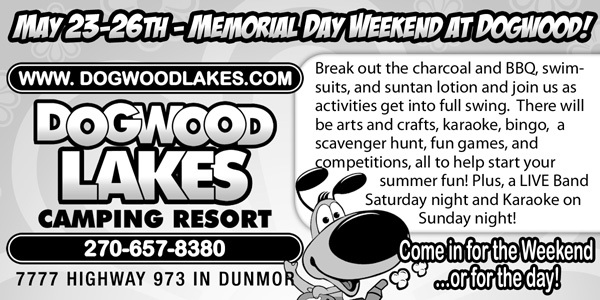 The Greenville Leader News and the Central City Times Argus local papers featured the ads. My coworker Ricardo Lowenstein conceived the adorable Top Dog character. He provided a total of four posed illustrations for me to use in the ads. I then dressed the pooch up in Photoshop to fit the themes of these events. Top Dog portrayed a motley crew of characters that included a vampire, Uncle Sam, a jolly pirate, and a mariachi singer. He rode in a go cart for Memorial Day, hawked a velvet Elvis painting for the yard sale event, flew a kite, and munched on a yummy chocolate bar. Other designers probably would have have considered the black and white newspaper format to be a limitation. However, I chose to look at it as a challenge. 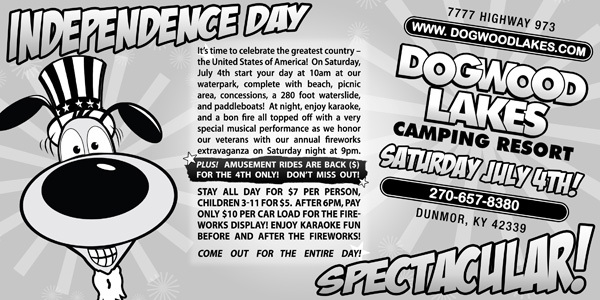 Without colors, I still used the elements I had on hand to create vibrant and fun advertisements. The ads were so successful in getting the word out in the communities of Muhlenberg and Logan Counties that we had some huge turnouts for the events. I always have fun reimagining characters in different scenarios in order to breathe new life into them. What can a professional newspaper ad design do for your business? Old school is still cool! Contact me today to get started.